Here we have Ken Stott as Balin on the left and Graham McTavish as Dwalin on the right. "As a young Dwarf prince, Thorin witnessed the destruction and terror wrought when a great fire-breathing Dragon attacked the Dwarf Kingdom of Erebor. After slaughtering many of Thorin’s kin, the great serpent, Smaug, entered The Lonely Mountain and took possession of its vast store of gold and jewels. No-one came to the aid of the surviving Dwarves, and thus, a once proud and noble race was forced into exile. 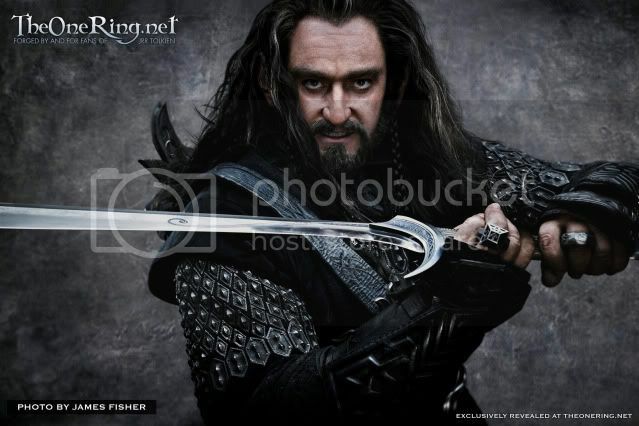 Through long years of hardship, Thorin grew to be a strong and fearless fighter and revered leader. In his heart a fierce desire grew; a desire to reclaim his homeland and destroy the beast that had brought such misery upon his people. So when fate offers him an unusual ally, he seizes the chance for revenge."